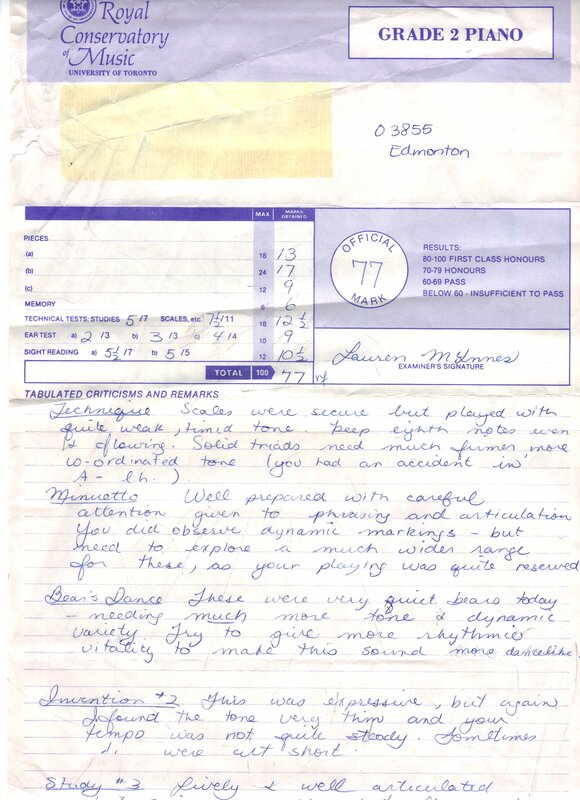 In what may well be an act of monumental folly and indiscretion, I’ve posted a scan of a musical report card I received a few decades ago. Instead of validating my burgeoning, prodigious talent (as one might expect, given that I’m posting it), the evaluation from the undated Grade 2 Royal Conservatory of Music piano examination rather condemns me with its indifference. The remarks are relatively positive, as befit those given to a child still in the single-digits column of age, but are still reserved. The grade is neither impressive nor disastrous. Lest anyone think I’m inciting the wrath of the internet to descend upon the examiner “Anonymous Group”-style, I consider her assessment to have been entirely correct and fair. At that time I had no affinity for or understanding of the instrument or its medium. I pressed my fingers upon the keys in the prescribed order in a rough approximation of the right time and hoped for the best. And as the evidence attests, my best was apparently 77%. The issue of standardized testing in music, of which this is an example of the voluntary kind, deserves its own blog post beyond the previous entry. Suffice to say for now I dispute neither the grade nor the process, both being like democracy the worst of all possible respective forms except all those already tried. But the grade itself interests me far less than the written assessment. The common theme running through the document is the overall timidity of the performance, the lack of presence, tone, and confidence. And truth be told, I wasn’t confident. I was incredibly nervous, at that time failing to appreciate the very nature of what it was music performance demanded. It’s really quite a beard. I’ve written about confidence in the past at length, and I won’t repeat myself on the subject, but this moment of nostalgia for the good bad worse old days of my life in music was prompted by a moment last week in Halifax. The orchestra dress rehearsal had just concluded, and I took some time to field questions from the schoolchildren who were in attendance to observe the process. 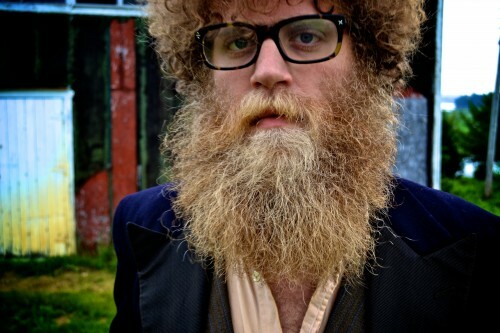 While most of the inquiries focused on the extraordinarily abundant facial hair of the artist, the final, overwhelming, shouted, insistent request was that I perform on the piano still parked on stage. I stopped playing piano for all intents and purposes about 20 years ago. Some of my piano teachers might argue I stopped a few years earlier than that. But as I sat down, feverishly attempting to recall something, anything to memory, I had a flashback to that mortifying moment of sitting down at an upright piano in a hotel room to play for the benefit and esteemed opinion of a single examiner imported from the other side of the country. The situation last week was exactly analogous, except here I was onstage at the largest music performance venue in Halifax, sitting down at a Steinway concert grand, about to perform for 200 very demanding young people – and feeling exactly (surprisingly, for a seasoned performer) the same. Bach. Goldberg Variations. Aria. I pressed my fingers upon the keys in a reasonable facsimile of the prescribed order in a rough approximation of the right time. Timid, nervous, lacking presence, tone and confidence, bending my fingers to my will and that of Bach’s after decades of neglect. Notes failed to sound, and of those that did, not all were consonant with Bach’s intention, but I made it through. Where was this famed confidence that a life in music supposedly breeds? Right where and when I needed it – when I moved from the microphone to the piano and sat before the 88 keys. There are two kinds of confidence. The boundless, impractical, unreal kind which the very young espouse when they believe they can take over the world, when they believe they already possess the answers to whatever challenges lie ahead, no matter how wrong or deluded they are in reality, no matter how fate and life collude and conspire against them and their ambitions. It’s the kind of confidence that we celebrate in child, indulge in an adolescent, and bemoan in an adult, knowing that ill-informed or unjustified assurance is simply the pride before the very dangerous fall. And then there’s the quiet, non-ostentatious confidence of self-efficacy, the self-awareness that we may not have all the answers, but that unknown or unfamiliar challenges may still be surmounted, that we have the tools to get ourselves through, and that a failure remains a possibility – but that it can be a healthy, helpful possibility, not a crushing, defeating, damaging one. This is the kind of confidence that motivates entrepreneurs through their failed startups, athletes through off-podium finishes, and a person like me from a mediocre but honourable attempt at piano 20 years ago to another mediocre but honourable attempt last week. But this time I wasn’t worried about “failing.” I wasn’t worried about anything, just curious about myself, and who I had become. And I didn’t fail. I couldn’t, at that moment, unless I had declined to play at all. And they applauded me roundly, if only in recognition of the effort. There’s the confidence that deceives, and the confidence that supports, and a fine line between. Last week I understood and felt the difference. And if I had to award myself a grade, I’d give myself, oh, say, 78%. This time I performed from memory.